This past weekend as I sat at the table surrounded by books in Spanish, printables, and materials to teach our son Spanish – I felt overwhelmed. For a few minutes as I watched my son gather his toys from the floor to begin our lesson I thought, “Can I really teach my child to be fully bilingual, and biliterate?” I silently prayed to God to use me as an instrument to teach my child the gift of another language. I’ve faced many challenges, celebrated many milestones; and have had regrets as well. It has been so much work, time, and dedication in helping my child to become bilingual considering our present circumstances: completely monolingual environment! Now, I’m working on teaching him to read in Spanish. Which is so much different than simply speaking to him in Spanish. My worries instantly subsided with his reaction. Then I realized that this was God’s answer to my prayer: my son’s enthusiasm to learn Spanish! I am so thankful for his contagious enthusiasm, and excitement to learn a new language. This is exactly what I needed to continue in our journey. This will keep us both motivated, and looking forward to sharing together new learning experiences, and milestones in his language learning. 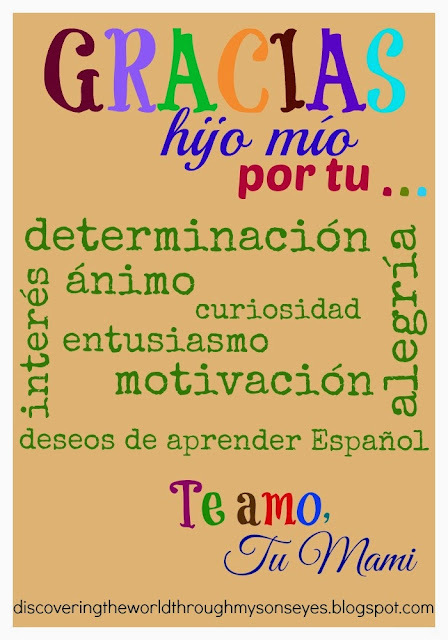 This will be one of the greatest gift I can ever give him, and I am so thankful for his desire to learn Spanish! Have you ever felt overwhelmed? Or doubted your ability to teach your child another language? If so, please share, and comment below. I would love to read about your experiences. This post was written for inclusion in the November 2013 multilingual blogging carnival hosted by Bringing Up Baby Bilingual. I know how daunting it is to contemplate teaching your child to read in another language–some of my French friends here in the US haven't dared to encourage their kids to read in French for fear of "interfering" with their English instruction in school. But when you can make it fun and hands-on, like the lesson you describe on Spanish Playground, it turns into rich mommy-son time, like a game! I love reading this, because I have the exact opposite problem: I just assume I'm going to be good at teaching my daughter a second language, so that I'm shocked every single time the her enthusiasm doesn't match mine. It's a funny journey, isn't it?!! Yes I feel overwhelmed and I doubt my ability – we've put language learning on hold for so long and I really don't know when we'll start up again but your successes inspire me! Sometimes I think it's outwardly people looking in. Not to be negative, but people are taken aback when you try to do things and are successful in doing them. Sometimes it's like, well you think you are better than me. Not sure if I'm explaining it right, but you really have to have a strong belief in yourself. You can't look to others to validate what you are doing – because you won't get it. You know what's best for your son. You know how to teach him – better than anybody else. You know what he needs. I would say, just keep at it. Life is a journey – and in our world of wi-fi, high speeds, mobile phones, we want things to happen quickly. Education doesn't work that way. It's slow and steady. it's consistency. Anytime you have these thoughts and feelings – you gotta replace them with positive thoughts. Negative thoughts have no place – they are just a waste of time and effort. I admire you for keeping at it, no matter what. You are doing such an amazing job. Thank you Sarah! I really do appreciate your comment. I totally get what you're saying about your French friends, I have relatives that don't teach their children Spanish either. Not only for for of interfering, but because it really is a lot of work! Oh Lisa! I totally get where you're coming from! I love your words of encouragement, and it's true… consistency, slow and steady will get us where we want to. I just pray that God just continue to give me the strength to keep at it, even at times when I doubt myself. Again, thank you for such kind words. I always love these posts you write about your bilingual journey…they are always so encouraging to me! !